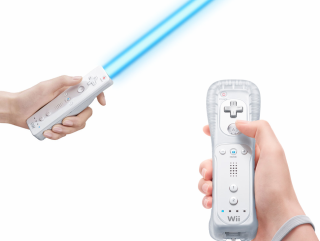 When the Star Wars light sabre game launches next year, you'll be able to wield your weapon a bit more safely! Nintendo is launching a 'Wii Remote Jacket', a durable, silicone cover for the Wii Remote. The company says that it will provide "a variety of benefits for the player". One of those added benefits will presumably be protection against living room damage should you accidentally hurl your Wiimote across the room at your expensive television or a family member. But use of the Wii Remote Jacket is meant to supplement, not replace, the basic game-play instructions - you'll still need to keep a firm grip on the remote, and letting go of the controller is still a no-no. "We're always looking for ways to improve our products and make sure everyone has a safe and fun experience," says George Harrison, Nintendo of America's senior vice president of marketing and corporate communications. "Many electronics manufacturers provide similar protective covers for products like cell phones, PDAs and MP3 players." Nintendo will include the Wii Remote Jacket free with all Wii consoles and all Wii Remotes sold separately too. Hardware featuring the Wii Remote Jacket will begin shipping to retailers this month and will be available shortly after.